There is a rich legacy of myth and magic infused into the island of Chiloe. Mythology and religion live side-by-side on these shores, which is a testament to a history molded by both the indigenous Mapuche and Spanish conquistadors. The Jesuits who came to Chiloe did not wipe out the Native culture but incorporated it into a religious context. The wooden chapels of Chiloé are considered as UNESCO World Heritage sites for their cultural significance, blending native and Spanish beliefs into the churches. Each chapel has southern-facing front doors to protect them from the rain. We see many of them throughout the island. i appreciated the calming, subtle colors of the church’s interior and the solid construction of its supports, all made from wood. You can see how functional and integrated into daily life these churches are. Residents of Chiloe call themselves Chilotes instead of Chileans. Their remote location, enabled them to keep their identity and remained loyal to Spain for many years. The first thing we seen in the town of Castro are small children dressed in the costumes of these mythological creatures. I am surprised they let us photograph them. Witches and Warlocks are often blamed for the unexplainable things in Chiloe. Every night there is a post card with a child’s drawing on our bed at Tierra Chiloe. It is one of the colorful supernatural mythological creatures of Chiloe with an explanation in English and Spanish. It is from books written by the hotel manager’s wife and illustrated by their children. La Pincoya is one of the most ancient mythical creatures In Myths and Legends of Chiloe. Huenchula is a girl who falls in love with the King of the Sea. Fiura is an ugly woman with bad breath. She lives in the woods and seduces young men before driving them insane. Trauco, the forest troll, seduces young women and is blamed when they return — pregnant. Caleuche is a ghostly ship which glows in the fog and travels at great speeds both above and below the water, emitting beautiful music, carrying the witches to their next stop. Journeying through the archipelago, it’s crewed by shipwrecked sailors and fishermen who have perished at sea. There are many more creatures. I realize at the end of my visit that these stories, like the scenery, architecture, handicrafts and food is part of the essence of Chiloe and a bit of what makes it so special. I wish I could say I thought of that but I took the title from the Guardian. Maybe some of you not Brits had missed it. 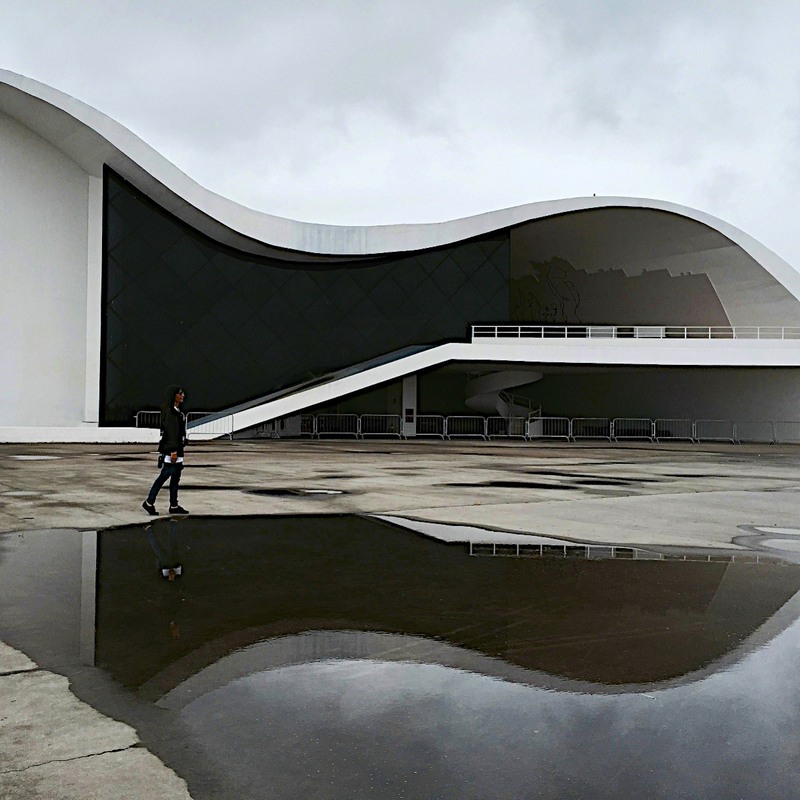 One of Brazil’s greatest architects was Oscar Niemeyer who was known for his curved spaces and ramps. Beauty, spatial drama and lightness was more important to him than functionality. His use of concrete and steel was done in ways that had not been seen before. He died in 2012 at 104, a world-renowned architect, with hundreds of works in Europe, the Americas and Africa. Niemeyer became a member of the Communist party in 1945. In 1964, when a military coup overthrew the government, Niemeyer was threatened and resettled in France and did not return to Brazil until the end of the military dictatorship in 1985. He designed the communist headquarters in Paris. 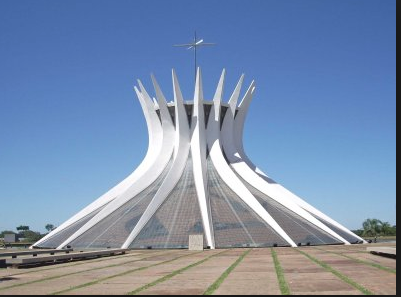 I am a wannabe architect and a fan of beautiful buildings and could not wait to see his structures in Brazil. 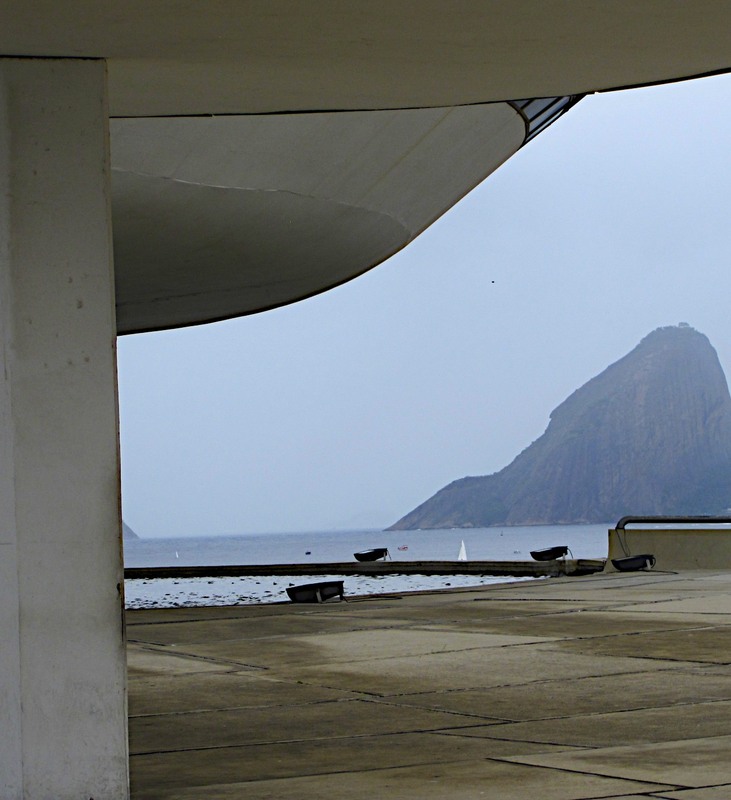 Some of Niemeyer’s most famous and recent work can be found in the city of Niterói across the bay from Rio. 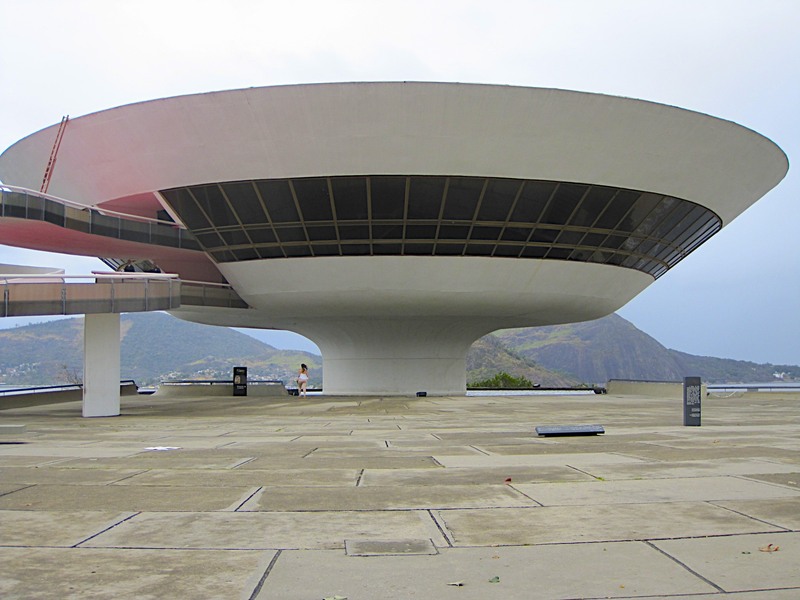 Niteroi has more buildings designed by him than any other city outside of Brasília where he redesigned the capital city. 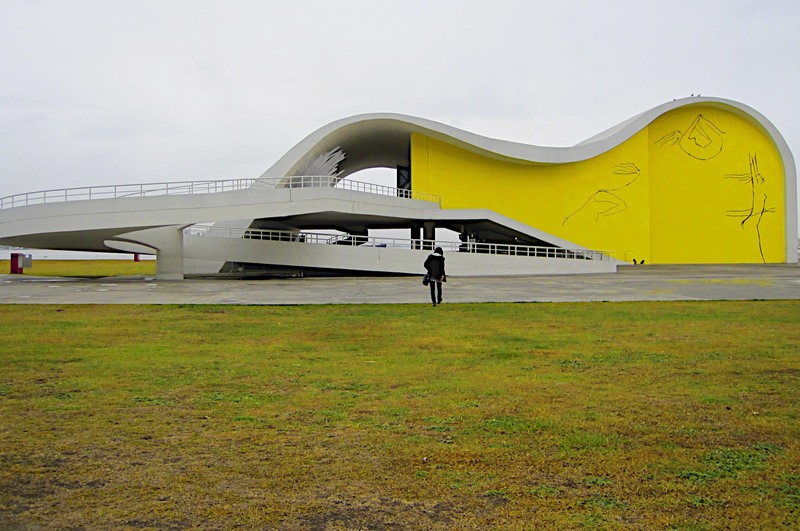 The Museu de Arte Contemporanea (MAC) overlooks Guanabara Bay. The museum is a direct response to the natural topography of the bay. The curve of the structure matches the curve of Sugarloaf. The building is the anti gallery white cube space. You can see the relationship of art, architecture and the surrounding landscape. 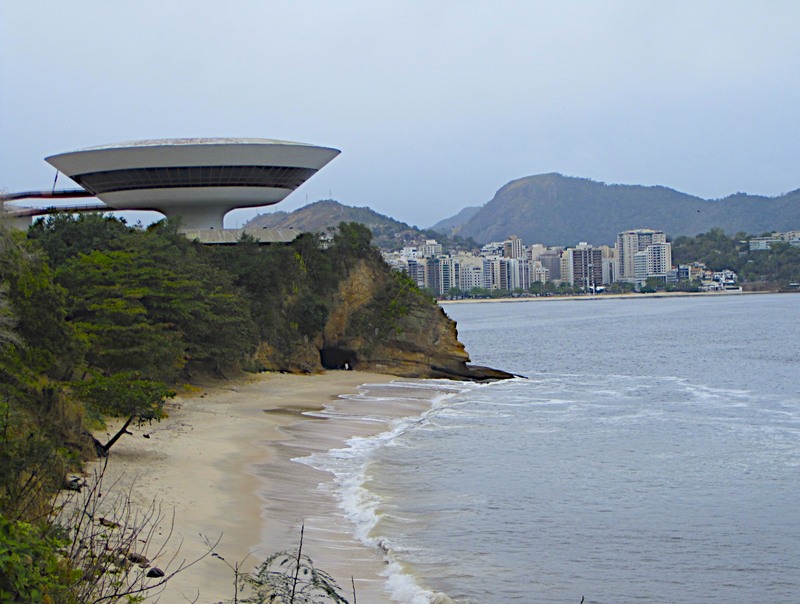 The Theatre of Niteroi is another great example of Niemeyer style. 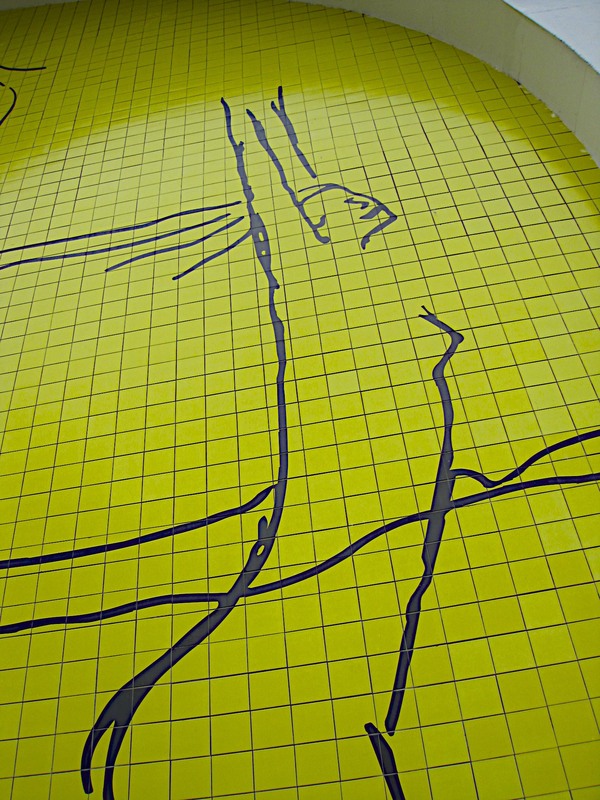 The drawing on the front by Niemeyer is done on each individual tile. The green and yellow color scheme represents Brazil’s flag. 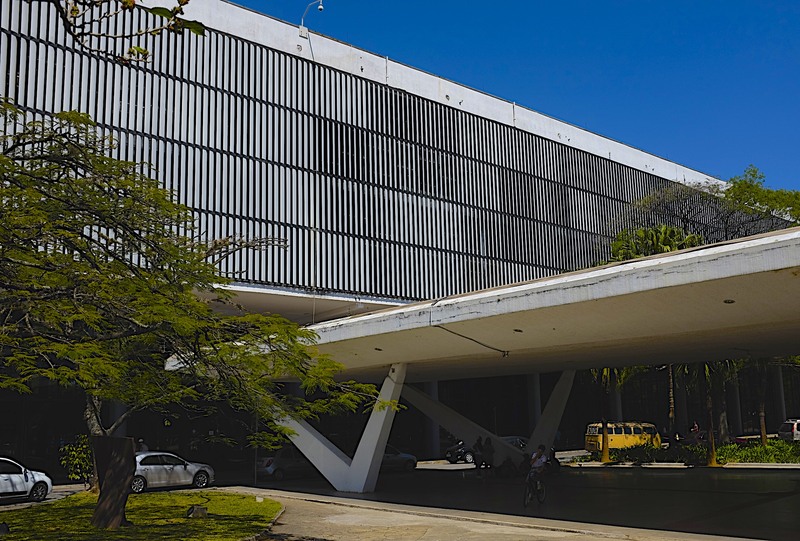 Oscar Niemeyer designed several of the buildings in Ibirapuera Park in São Paulo. 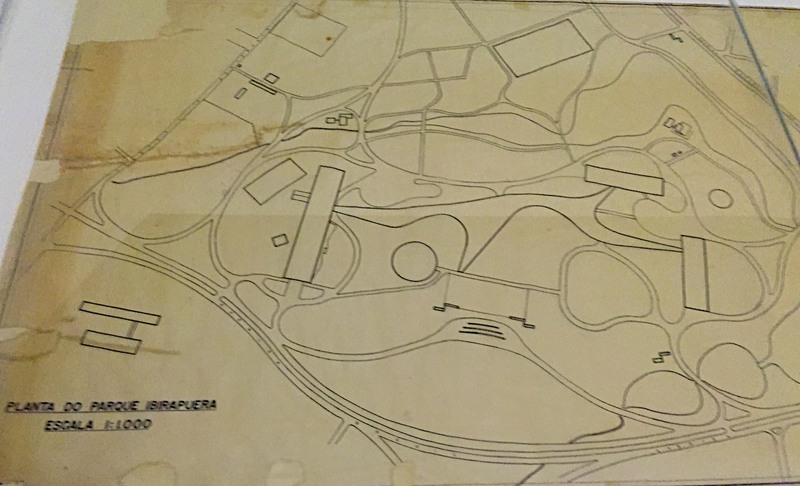 Roberto Burle Marx and Otávio Agusto de Teixeira Mendes provided the park’s landscape architecture. The park opened in 1954. 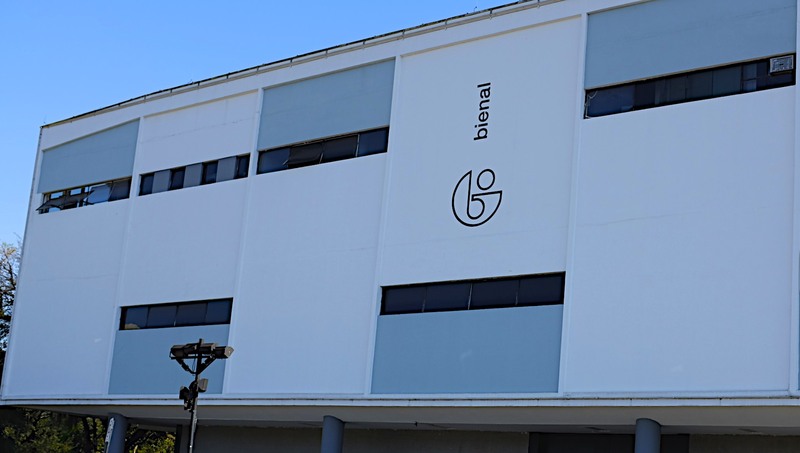 The Bienal was built to host a biannual art exhibition which started in 1951. São Paulo was the second city in the world after Venice to do this. A major art exhibition is held here every two years. The Marquise was also designed by Niemeyer. 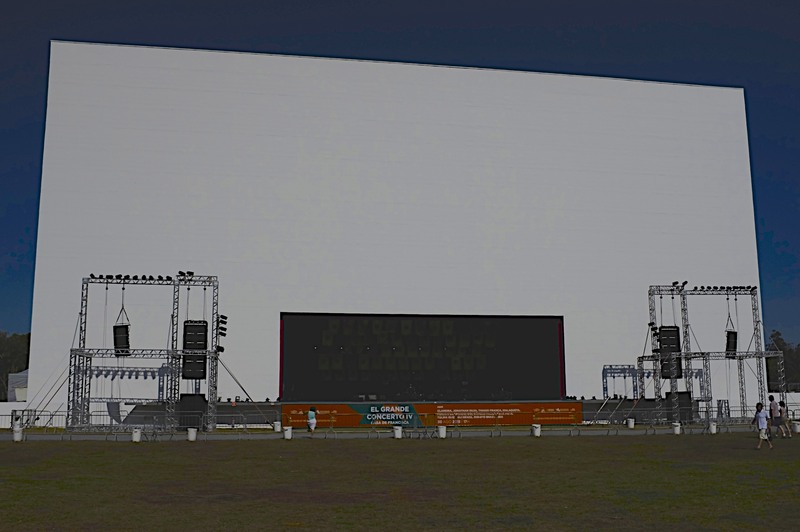 It’s a large, covered space that curves through the park behind the Niemeyer buildings and connects the Modern Art Museum to the playground and an outdoor restaurant. It’s used now as a place for people to relax, skate, and rollerblade. 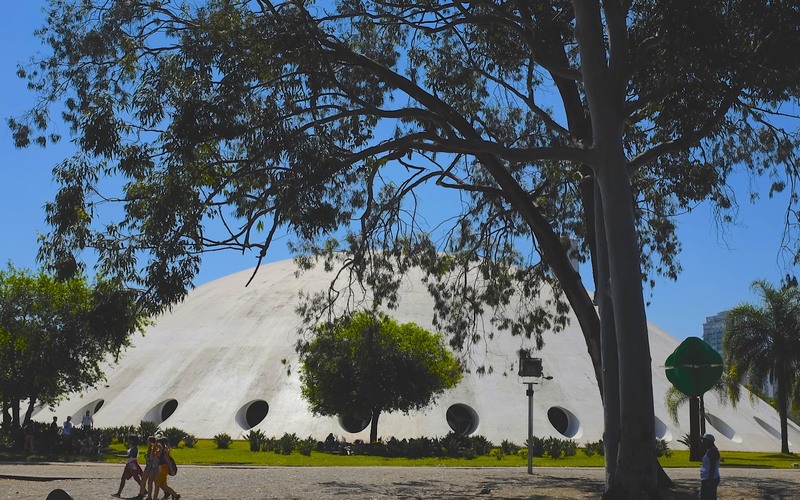 Oscar Niemeyer designed the Oca auditorium in 1951. The white domed structure is now used for traveling art exhibits. 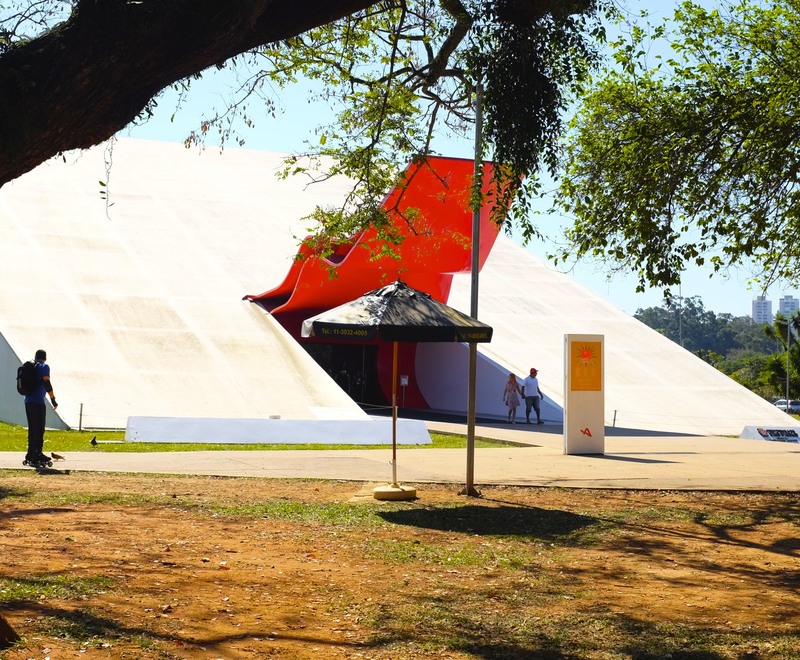 The full name is Pavilhão Lucas Nogueira Garcez, and it was built to commemorate the city’s 400th anniversary in 1951. It is called the “oca” because it resembles the traditional Native American dwelling. 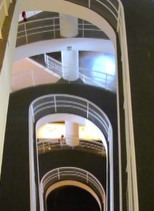 The interior has 4 levels, each connected by a ramp that spirals around. 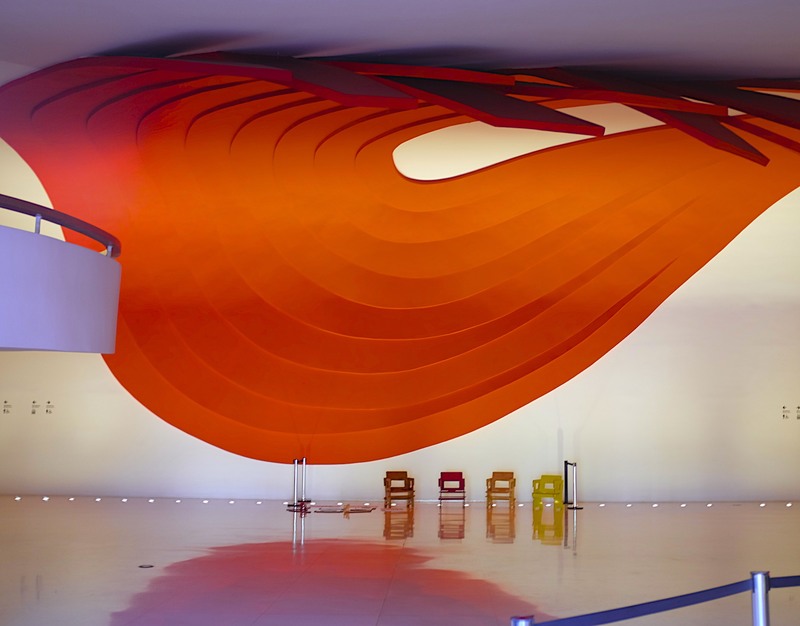 In 2004 Niemeyer co-designed the Park’s Auditorium with the “giant red tongue”. This futuristic building was in the original design of the park but was not built until much later. The Copan was one of Niemeyers early masterpieces. 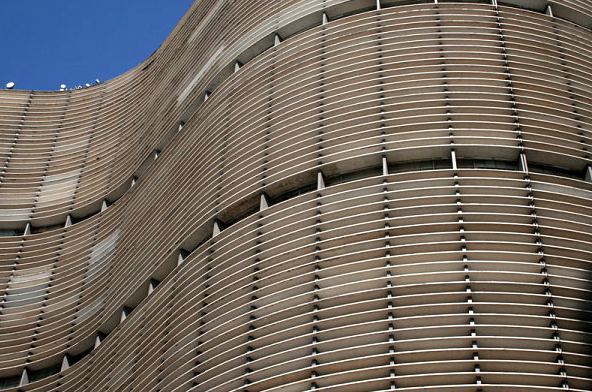 It is an imposing S-shaped building in the Centro district of São Paulo. Having studied some architecture, the Copan for me has always been a symbol of São Paulo. This is the largest residential building in Brazil, and, reportedly, the most populated single residential building in the world with room for seventy businesses on the first floor. It has its own zip code. The downtown area is a bit seedy but i’m sure with gentrification the apartments are being restored. 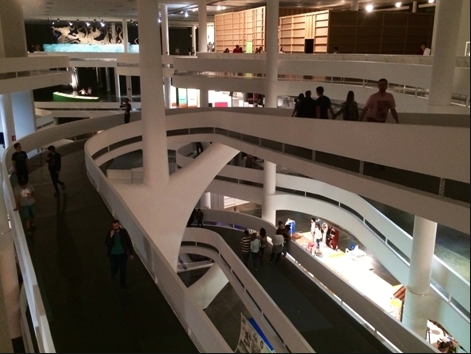 Niemeyer went to the office everyday to work on his designs and oversee his projects till his death at 104. He believed in using architecture as a way to create a better world through better design. 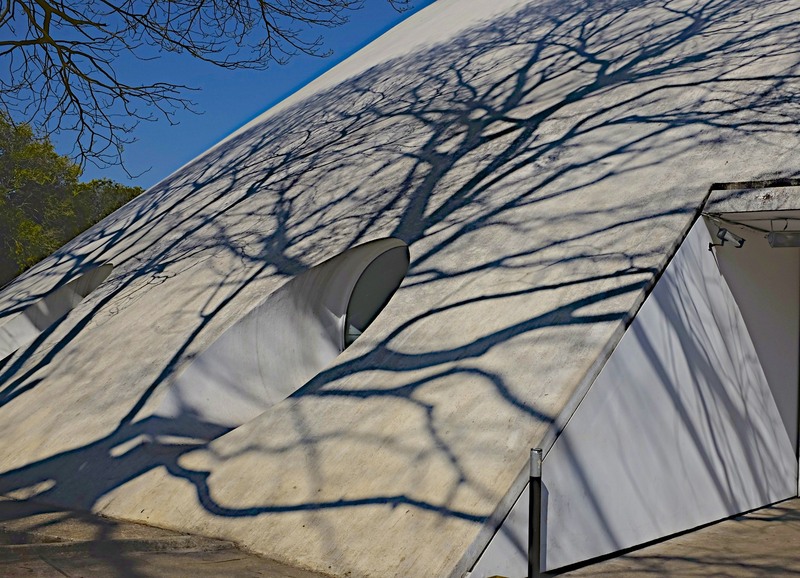 Special thanks to my guides Arthur Simoes in São Paulo and Gabriel Morand in Rio for their knowledge, patience and stories about an architect that I have admired for a long time.